It is common to see online shoppers navigating away from a page to another on an online shopping portal while choosing the product and checking out at the cart. To enhance the navigation experience, a navigation chain called “Breadcrumbs” is placed on every page of the eCommerce website. Breadcrumb trails enhance the navigational experiences of eCommerce shoppers by helping them navigate to parent categories or the previous pages without conducting a search or pressing the back button. In addition, breadcrumb trails help visitors from external websites to know where exactly they are placed in the hierarchy of your eCommerce store and help them further explore the site from where they landed. What Are The Benefits Of Breadcrumbs In eCommerce? Using the right breadcrumb in the right place helps search engines to navigate easily to your website, thus enhancing the SEO of your eCommerce site. They ensure that the users are not struck at a page of the website and help in quick and easy landing on desired product or category pages. Breadcrumbs also provide a seamless user experience by providing quick and correct results. They act as a source of contextual information to help users find what they are searching for on your website. 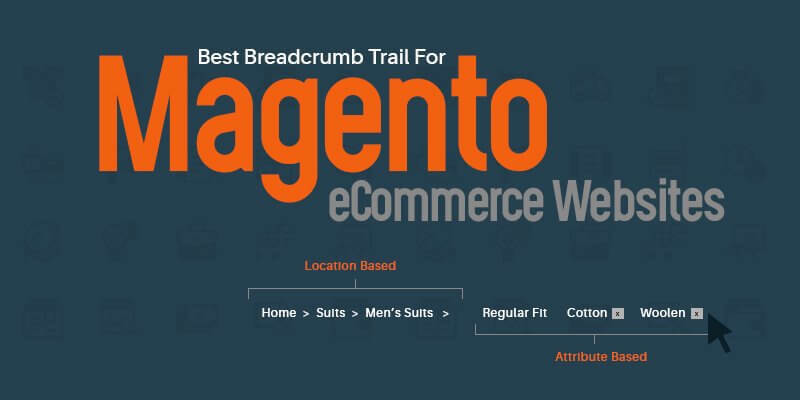 Magento, being one of the most trusted CMS providers for eCommerce platforms, uses two types of breadcrumbs: location-based, and attribute-based. Though both are a form of breadcrumbs, they each have their own set of advantages. Most of the top notch Magento eCommerce websites use location based breadcrumbs. Location-based or hierarchy breadcrumbs represent the structure of your site and show where the visitor is located. This type of breadcrumb trail helps visitors navigate easily and search for more product options, thus helping to reduce the bounce rate of your eCommerce store. In addition, location-based breadcrumb trails can function as an assistant to search engine robots by helping the robots see how the pages of your site are related to each other. This process helps you get a good search engine ranking and enhance the CRO of your eCommerce. Attribute-based breadcrumbs are not as common as location-based breadcrumb trails since they majorly depend on the product categories and content of the site. These breadcrumbs are also referred to as keyword or tag breadcrumbs. Though the attribute-based breadcrumbs are navigation disabled, they allow visitors to unselect the filters that they have applied during a product search. Every eCommerce site will at least have the location-based breadcrumb trailer implemented in order to show the user’s location in the site’s hierarchy. If you are an eCommerce owner with a content rich site with many products to showcase, then implementing attribute-based breadcrumbs will be the right choice. From the perspective of UX and SEO, it is wise to always include both location-based and attribute-based breadcrumbs to generate more sales from your visitors. Most CMS providers include breadcrumb trails by default: however, to ensure that the breadcrumbs are optimized you need the help of our experienced Magento 2 Development Experts. If you believe the breadcrumb navigation menu in your website is poorly optimized or you need help with setting up the best breadcrumb trail on your Magento 2 eCommerce site, get in touch with our Magento Development Experts. We will be more than happy to assist you to ensure your eCommerce success.